Sasakani's Herakle Kabuterimon (Left) and Gerumon's Jesmon (Right) face off in the Digivice tournament finals. September 29th, 2015. Fan event organizer DIGIMADO published the results of their most recent All Digimon Cultural Exchange from the 26th. 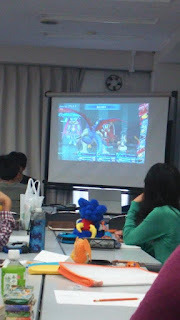 As well as being a general assembly of fans to discuss the Digimon franchise, the exchange centered around a six-hour Hyper Colosseum card tournament, and simultaneously held competitions for Digimon Story Cyber Sleuth, handheld Digivices and virtual pets, and an imported Digimon All-Star Rumble. Approximately forty persons participated in the exchange, ten short of the event's cap. Participants competed under their internet pseudonyms rather than their real identities, many of them using their Twitter or blog handles that were already known in the Japanese Digimon community. The teams of the Cyber Sleuth finalists are detailed below, along with the partners of the Digivice tournament finalists, and the All-Star Rumble championship team. Cyber Sleuth finals, by Gerumon. The Cyber Sleuth tournament employed a chess clock ruleset where each player was permitted a maximum of 15 minutes to make decisions; each turn their timer would count down, and freeze when they ended it. 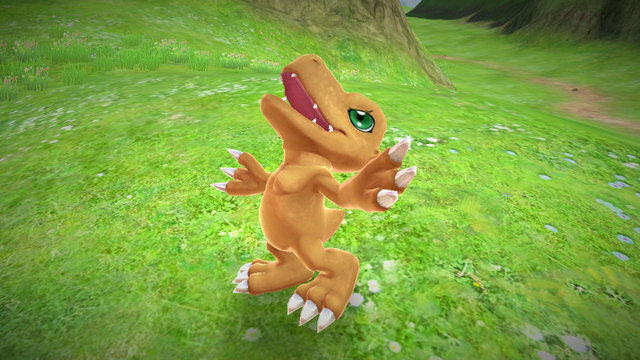 Players were also prevented from having more than one Digimon with recovery or revival skills active, strategically limiting them to just one medic Digimon. Seraphimon became the cleric of choice of the tournament, favored for his incredible Perfect Revive skill, which revives all team members and fully restores their hit points in exchange for 80 SP--just over 60% of his maximum. Because item usage was not allowed, the Spirit and Physical Drain abilities were found on most Digimon, which both take 10% of the damage those abilities deal and restore that value of SP to the user. In this way each turn could be carefully planned out in advance, surrendering a percentage of one's SP for different attack abilities, then strategically using Drain skills to ensure that they would not run out of SP on succeeding turns, gradually wearing one another down. This article uses affiliate links. Affiliate links are hyperlinks which redirect the reader to a product on an e-commerce website; if a reader accesses one of these listings through one of the links below, and/or purchases the item listed, the editor is provided a referral fee and/or commission fee. Affiliate links are labeled when present, and the service being linked to is identified. In the handheld device tournament, Jesmon from 2014-15's Digivice Ver. 15th was the primary choice for most entrants. Jesmon has the highest base stats of any Ultimate-level Digimon at 7 HP/5 AP, surpassed only by the Super Ultimate Omegamon's 8/6. 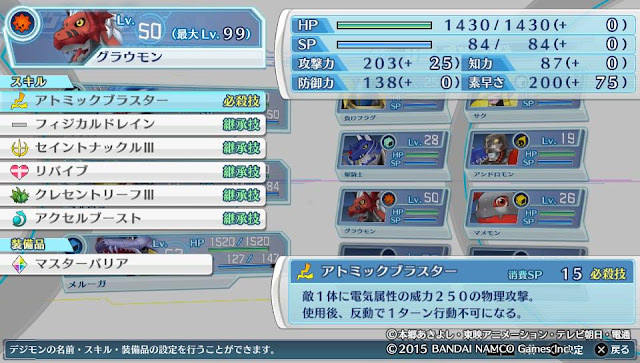 Omegamon cannot be used in versus battles though, because he has a two-step evolution--first warp evolving from Agumon/Gabumon to War Greymon/Metal Garurumon, and then Jogressing to Omegamon. 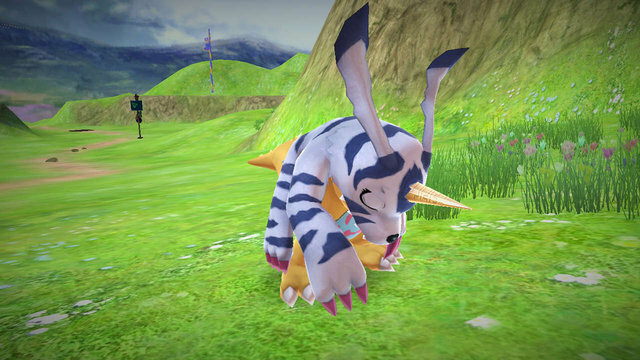 In order to maintain compatibility with the original virtual pets, there is effectively only one turn to evolve when connecting for multiplayer on the Ver. 15th, locking Omegamon out of tournament play and forcing tamers to use only Ultimate Digimon. Jesmon's 7/5 is one Attack Point higher than any other Ultimate, and his Data attribute gave him advantage versus 5/9ths of the Ver. 15th Ultimates, which are primarily Vaccines. This was what gave Jesmon the upper hand in grand finals versus Herakle Kabuterimon, also a Vaccine-attribute. Original photo uploaded by @gaiou_mon. Out of the top 4, fourth place tamer Gaiou was the only one not to use a Digivice Ver. 15th in the finals, instead bringing a Herakle Kabuterimon raised on his Digimon Pendulum 1.0: Nature Spirits. The day before the Cultural Exchange, Gaiou tweeted a photo of his Herakle Kabuterimon gearing up for battle. His Digimon had evolved just in time for the event. On the Pendulum 1.0, when properly raised on a route of Mochimon > Tentomon > Kabuterimon > Atlur Kabuterimon, Heracle Kabuterimon has an improved probability to fire a superhit each round, with its superhit index being about four standard deviations greater than the average. (This is because the attribute of a Digimon at each stage of evolution can positively or adversely affect the superhit index, changing how wide the margin of error is for scoring a superhit during the pre-battle "count.") Unfortunately, Herakle was a less optimal call in the handheld tournament, as there were few Pendulums in the running to provide Virus-attribute opponents, due to the general excitement for the latest model of Digivice. The Pendulums, Ver. 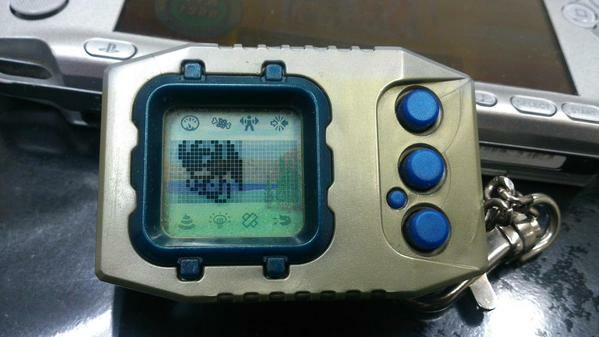 1~5 Digital Monster Pets, original Digivice, and Ver. 15th were all valid for play. However, the connection process for each device was different. 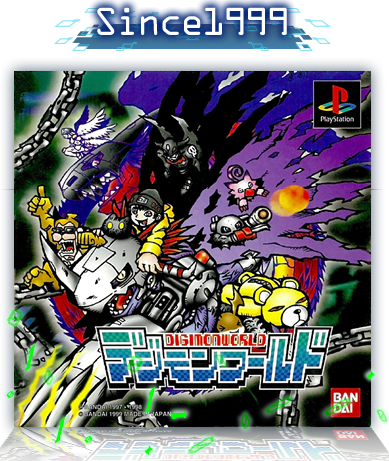 The original Digivice only battles as if it were a first generation Digital Monster pet, even against other Digivices; Pendulums are backwards-compatible with that system, but fight using their own best-of-three system versus other Pendulums, while the Ver. 15th has an HP/AP system for other 15ths. How the Ver. 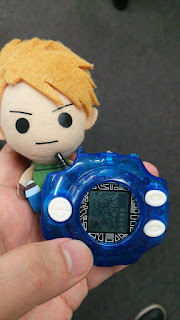 15th connects to the Pendulum is not well documented, but it's presumed to behave as if it were an original Digital Monster just like on the Digivice, with each Digimon having a flat percentage to win depending on which group they belong to. In this scenario all Pendulums register as Monzaemon, having a base 8/16 chance to win any battle. That probability increases depending on how the opponent registers. 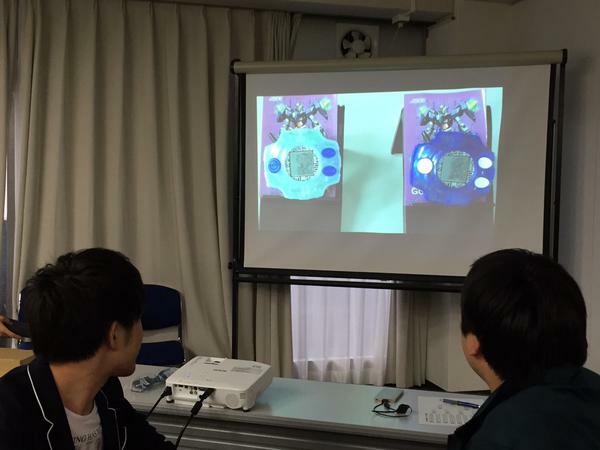 The top cut began shortly after 1:14 PM JST (12:14 AM Eastern Time), and shortly after the grand finals Gerumon tweeted about their victory, thanking Jesmon for their hard work. He had previously faced Hirari in the semifinals, while Sasakani had been paired with Gaiou. Jitenryuu uploaded screenshots of his Cyber Sleuth team to Twitter; all of their information, including statistics and nicknames, are given below. 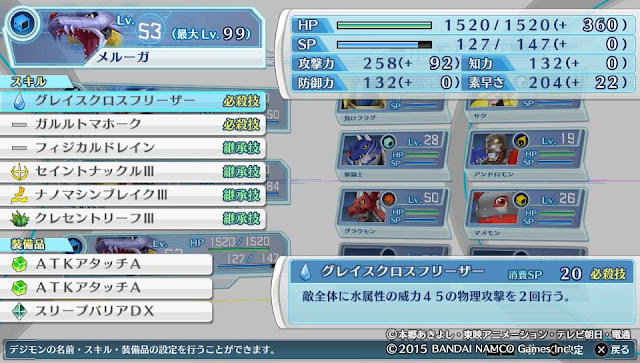 (In addition to these Jitenryuu also had a Mirage Gaogamon, but he chose not to use it on his team.) 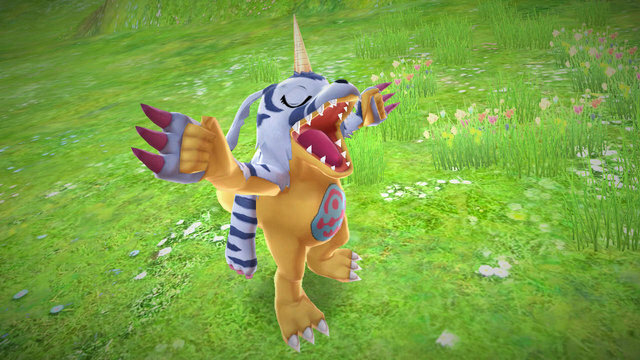 Controlling status was one of the most important aspects of the tournament, as status inducers like Lilithmon's Phantom Pain (three hits each with a 35% chance to poison) and Belphemon Sleep Mode (50% chance to put all opposing Digimon to sleep) have become highly prevalent in Sleuth's multiplayer. To cope with status, Jitenryuu came prepared with multiple specific-status blocker accessories, and the all-purpose Master Barrier. Master Barrier grants 50% immunity to all status ailments, providing the best all-around coverage one can get against status in Cyber Sleuth. Another element contestants fought for was control over the attribute and elemental cycles. The Character Reverse skill has become entrenched in Cyber Sleuth's Japanese metagame because of how it completely reverses the attribute and element cycles. This causes Virus Digimon to become strong against Vaccines, Fire to become strong against Water, Ground to become strong against Wind, and so on. If one loses access to Character Reverse, then they're unable to reset a losing battle in their favor, hence it's become staple necessary on most teams. Light Digimon like Seraphimon and Sakuyamon are invaluable with Reverse around because the relationship between Light and Dark is mutually damaging rather than cyclical, so regardless of if Reverse is used or not their relationship stays the same. Jitenryuu's decision to run Aero V-dramon rather than his evolved stage Ulforce was motivated by Aero's Dragon Impulse, which is lower costed than Ulforce's Shining V-Force relative to his maximum SP and Wind-aligned rather than Light-aligned (which otherwise would have been redundant due to the team already having multiple Digimon with Holy Knight and Saint Knuckle skills). Both Aero and Ulforce have the Godspeed ability, which causes them to always move first as long as there are no other Godspeed Digimon with a higher base speed in play, and can use the inheritable buff skill Speed Charge Field to raise their allies' Speed and attempt to create a turn lock. This makes Aero and Ulforce interchangeable except for the attributes and costs of their unique skills. According to Jitenryuu, there were only six participants in the Cyber Sleuth tournament. 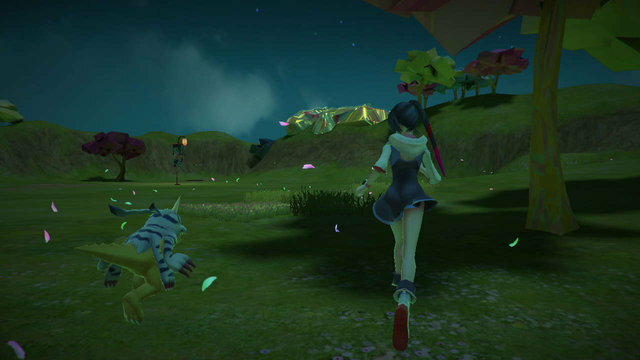 The low turnout was likely due to the difficulty of assembling a competitive team, as while raising statistically sound monsters is easier in Cyber Sleuth than in contemporary games like Pokémon, it still requires one to complete the main game and postgame content first, and acquiring multiple copies of specific accessories like Master Barrier can be a chore. Jitenryuu also entered the handheld tournament, using Gryphomon from Pendulum 4.0: Wind Guardians. Image not taken from the event. 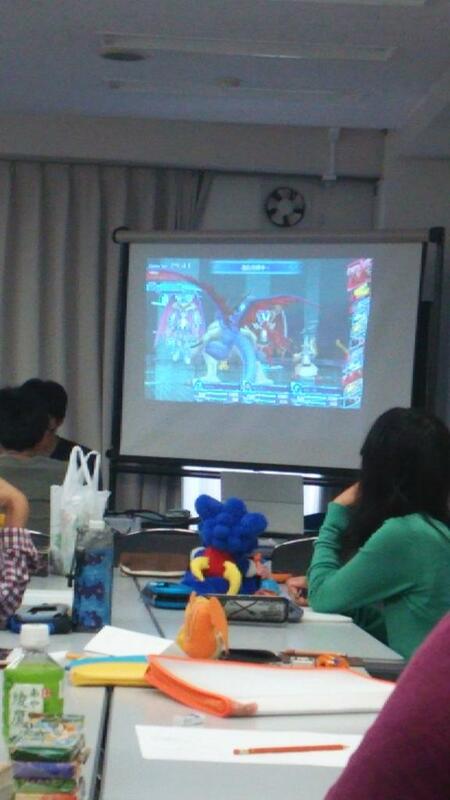 The All-Star Rumble tag team tournament was won by Jitenryuu and Susuyan, playing Impmon and Shoutmon. Both of these characters fall into the same general template, having fast long-range fireballs with low SP costs and strong knockback. 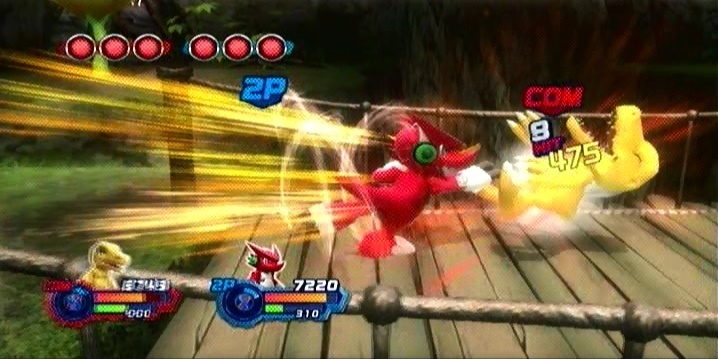 Impmon's fireball is unique in ASR for having a homing property that will chase the opponent across two thirds of a stage's horizontal range before expiring, from two separate angles of attack. Unlike Shoutmon's, Impmon's fireball can be fired while moving, which plays to his fast ground speed. All-Star Rumble's guard system favors players gaining ground quickly and refusing to lose it, as no resources are built up through guarding and once a Digimon's guard is broken a knockout becomes guaranteed. SP is not regained when respawning, so once a player's limited number of attack breaks are exhausted they become extremely vulnerable to fast, combo-heavy characters. This has created a bias favoring Agumon, Shoutmon, Impmon, and Wormmon over the other eight playable characters. Shoutmon in particular is one of the few Digimon that can begin an attack string immediately coming out of a guard with no delay, and his melee combos have incredible range that lock slow and shorter-range Digimon like Guilmon out of being able to compete on even ground. Stages for All-Star Rumble were selected randomly, and participants entered in a two-on-two format. 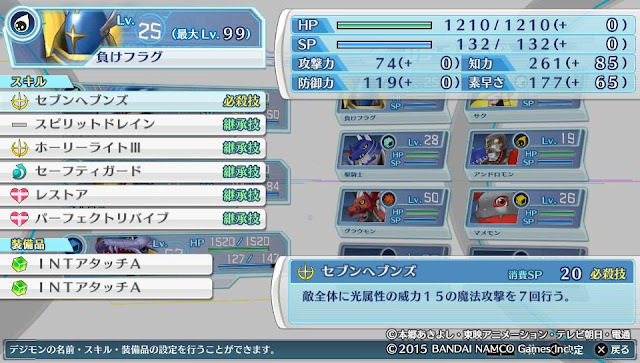 No Digimon nor stages were banned, and items were enabled. The previous All Digimon Cultural Exchange took place over three months ago. DIGIMADO hosts these events quad-annually, and will be hosting another combination meetup and tournament in December. By that time, the first film in the Digimon Adventure tri. series will have already debuted in theaters. DIGIMADO has plans to expand their scope in the future, increasing the size of the events and accommodating larger tournaments. P-Bandai Survey: Which Digivice Do You Want to See Reprinted? September 29th, 2015. 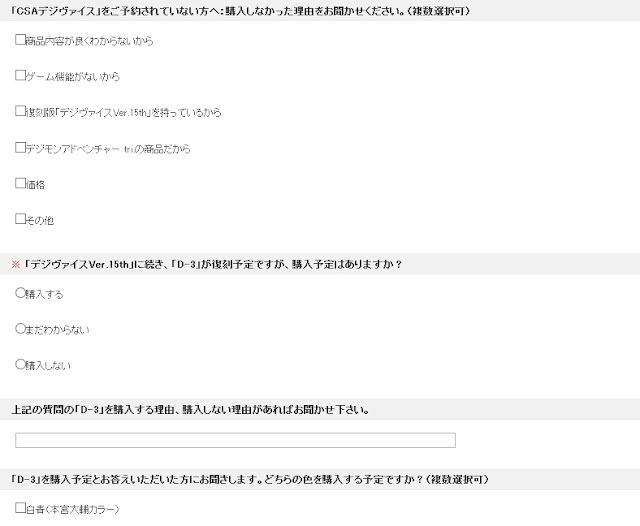 Early this morning Bandai added a survey to their premium shopping site "P-Bandai," asking users what types of products they would like to see in the future. 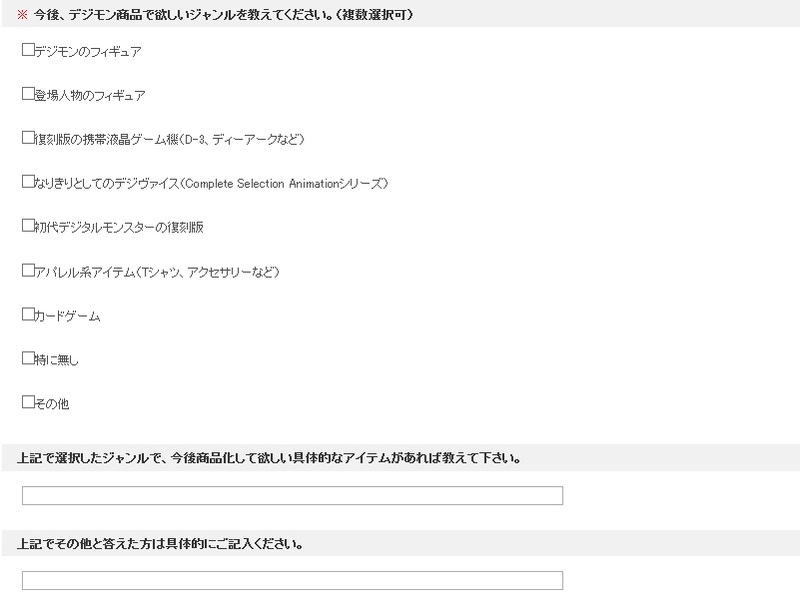 Although the survey is in Japanese, it is possible for foreigners to take it, and no account is required to submit answers. 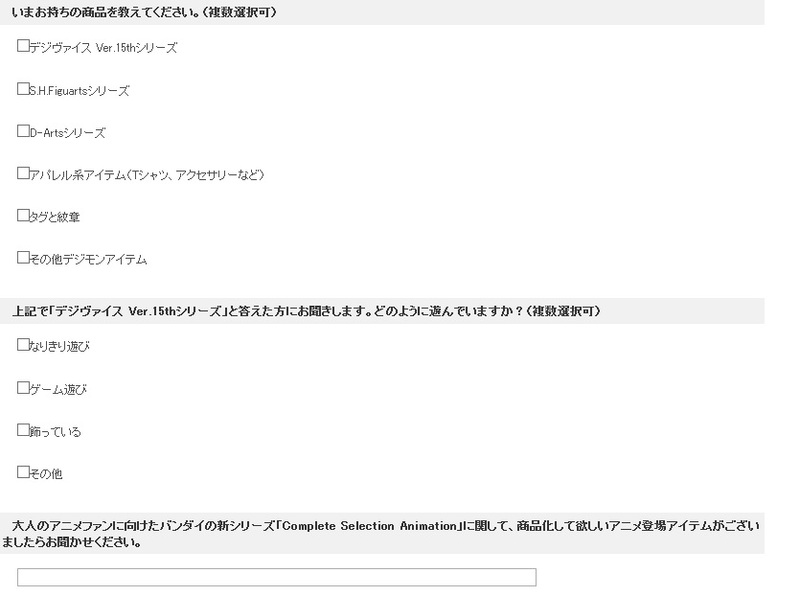 A translation of the survey question-by-question is provided below, to make it easier on foreign language fans to answer, with some precreated responses for the written portions. 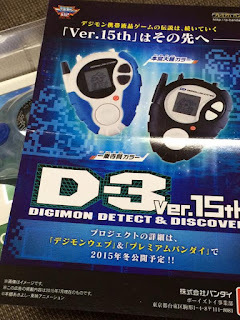 The survey is related to the approaching launch date for the first wave of Complete Selection Animation Digivices, a cosplay prop completely unlike preceding Digimon merchandise. The CSA lights up in the colors of the eight chosen children from Digimon Adventure and uses newly-recorded sound clips of the Digimon evolving, which will be used in Digimon Adventure tri. 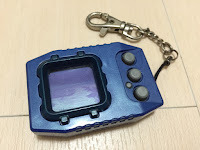 As it is a Digimon product but not a game like past Digivices, the CSA is somewhat uneasy territory for Bandai, and surveying both existing and potential consumers helps them gauge where to go next with upcoming products. 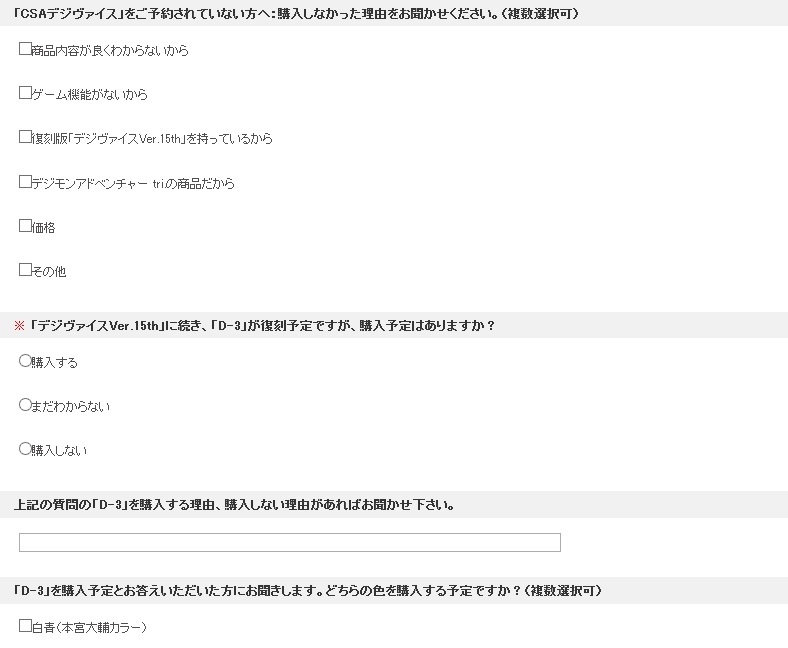 The survey is also concerned with whether or not users bought the Digivice Ver. 15th, if they intend to buy the D-3 Ver. 15th, and if there are any other older products they would like to see reissued like the D-Ark or Digital Monster pets. As Digimon has just come out of a very turbulent era financially, Bandai has a keen interest in polling consumer enthusiasm for different types of products. 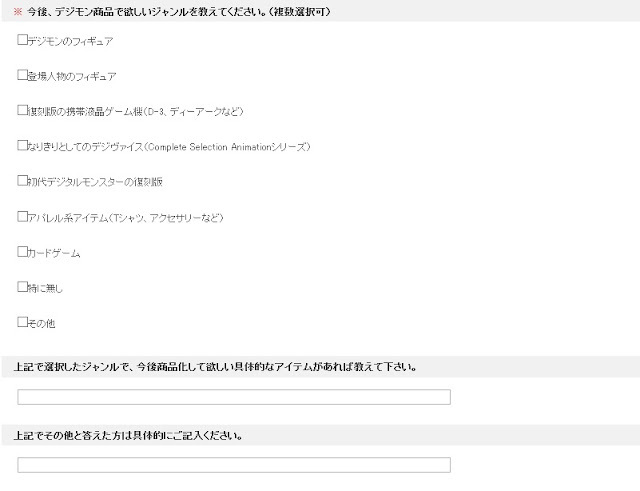 Of the genres selected above, please specify what kind of items you would like to purchase in the future. Those who selected "other," please specify. * Did you preorder the Complete Selection Animation Digivice (Herafter "CSA Digivice")? ⚪ I am planning to preorder it. ⚪ I am not preordering it. ⬜ It had the voice of all 8 Digimon. ⬜ It had new recordings of all 8 Digimon's voices. ⬜ Because I wanted to hear "Butter-Fly" and "brave heart." ⬜ Because the color changes from the shell's LED lights. ⬜ Because it reproduces evolution scenes. ⬜ The entirely new shape of the shell. ⬜ I was unfamiliar with the contents of the merchandise. ⬜ Because there is no game function. ⬜ Because I already have the reissued "Digivice Ver. 15th." ⬜ Because it's a Digimon Adventure tri. product. * Following the "Digivice Ver. 15th," a reissue of the "D-3" is planned, but do you intend to buy the D-3? ⚪ I am going to buy it. ⚪ I do not know. ⚪ I will not buy it. Related to the above question of "D-3," please tell us of any reason to buy or not to buy. 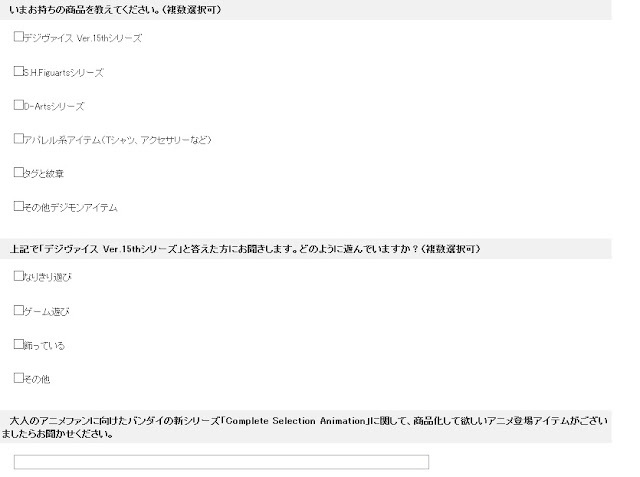 With regard to the adult anime fans of Bandai's new series "Complete Selection Animation," please let us know if there are items appearing in the anime which you wish to become available as goods. With regards to Digimon products, please let us know of any opinions you have. After you're done, click the green button at the bottom of the page to submit your responses. On the next page you'll be asked to confirm your responses at the bottom of the page, and then you'll be done. September 25th, 2015. For the past month Japanese Digimon fans have been circulating a schedule over Twitter for an upcoming gathering on the 26th, the "All Digimon Cultural Exchange & Tournament." The third of such meetups held this year, the event is being organized by DIGIMADO (デジ窓 "Digi Window") the de facto lead organizational force in the Japanese fandom since Odaiba Day 2009. DIGIMADO's formation was prompted by the demise of Bandai's official systems of organized play for the card game in 2008. In addition to hosting fan gatherings for the virtual pets, video games, and card games, DIGIMADO also puts out occasional podcasts in Japanese. 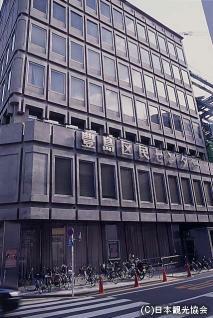 The exchange will last from ten AM to nine PM JST, and be held in the 12th meeting room of Core Ikebukuro (otherwise known as the Toshima Cultural Center), a regular location site for DIGIMADO. The organization is anticipating a maximum of 50 persons; those participating will have to pay a 500 yen entry fee, which grants them a day pass into Core Ikebukuro. Exchanges of this type are primarily coordinated over TwiPla, an event organizational tool that interfaces with users' Twitter accounts. At the time of this writing, 21 persons have preregistered for the event, 8 stated that they would "maybe" go, and 1 abstained. Planned tournaments include a Digital Monster Card Game (also known as Hyper Colosseum) competition, a single-elimination Cyber Sleuth tournament, a dot matrix virtual pet/Digivice tournament, and an All-Star Rumble tag team tournament using the PlayStation 3 edition of the game. 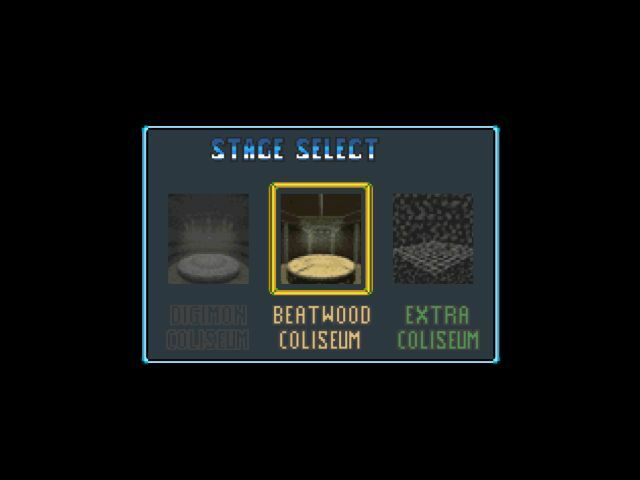 Digimon Tamers Battle Evolution and Digimon World: Digital Card Arena (released in western countries as Digital Card Battle) were listed on the event blurb, but no events for those games were found on the time table (translated below). The Hyper Colosseum tournament will use ruleset Ver.M3.0, a special set of rules created by DIGIMADO that act as a combination of tournament regulations, card errata, and deck restrictions. Newer fans interested in the card game will also be able to learn the game on-site; these types of events are one of the ways that Hyper Colosseum has survived over the years despite its last actual booster set having come out almost a decade ago, and its final starter deck launching two years before that. The portable device event will use a life system tournament (ライフ制大会 raifu sei taikai) where each participant is assigned a base "life" value that decreases when they lose a match. Opponents with similar records are paired each round, and those with a life score of 0 at the end of the round are eliminated from the tournament. After either a predetermined number of players remain or a certain number of rounds have passed, the surviving tamers are then moved on to the top cut, where they are paired against one another in a tournament bracket to determine the champion. Other devices are not permitted for compatibility reasons. 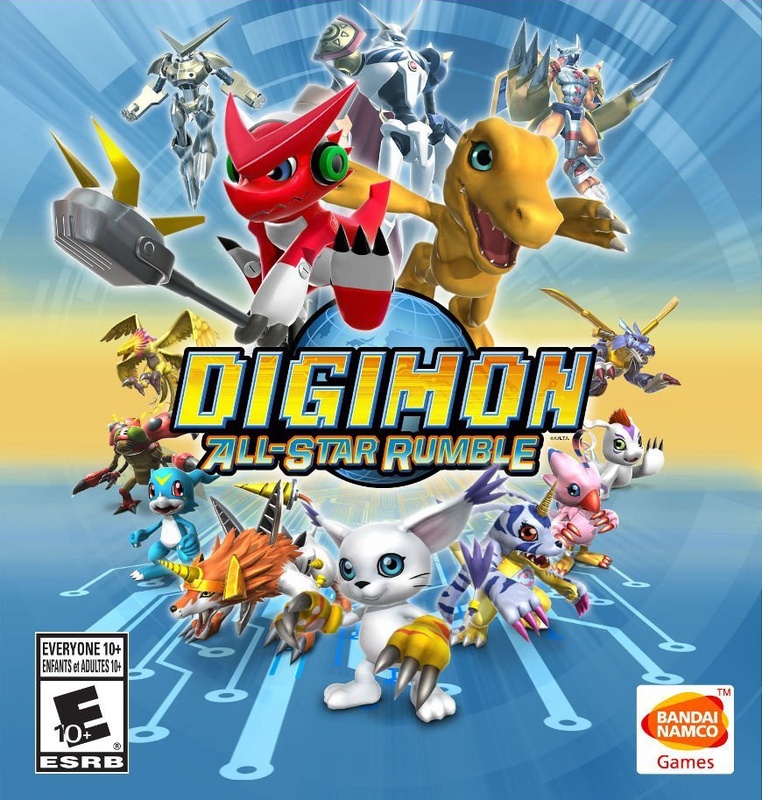 At 6:00 PM a Digimon All-Star Rumble tournament will be held using the PlayStation 3 edition of ASR, in a two-versus-two tag match format. Tournament regulations permit the use of all 12 characters, as well as the changing of evolutions prior to the beginning of the match. However, one's Digimon of choice is fixed; hence someone that chooses Agumon must continue to play Agumon for the entire tournament, though they may switch between enabling his War Greymon or Omegamon evolutions freely. 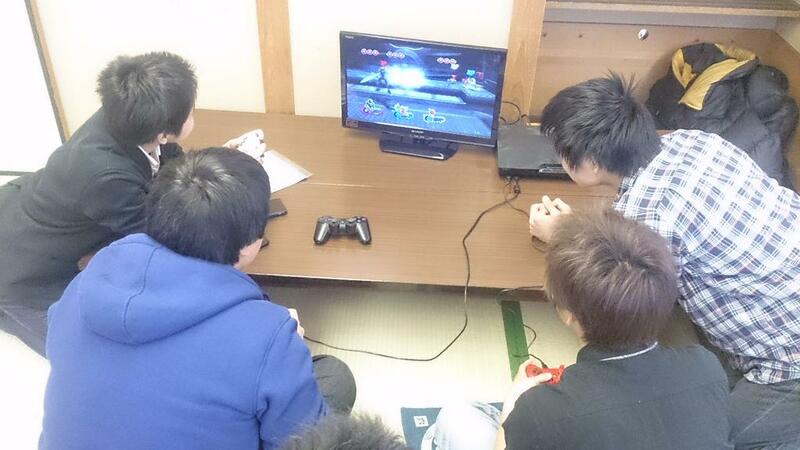 (This is a standard for Japanese fighting game tournaments; similar rules prevent changing characters in Super Smash Bros.) Stages are selected randomly, items are turned on, while Digicards are turned off. Original image uploaded by DIGIMADO. 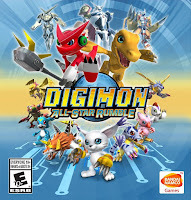 Although many English-speaking fans would prefer to forget All-Star Rumble existed, treating it as a shameful stepping stone towards Cyber Sleuth's international release, Japanese fans have latched onto the game as the most recent in a line of Digimon fighters, going through the trouble to import it in face of its lack of a Japanese release. ASR was also played at both preceding 2015 DIGIMADO exchanges. 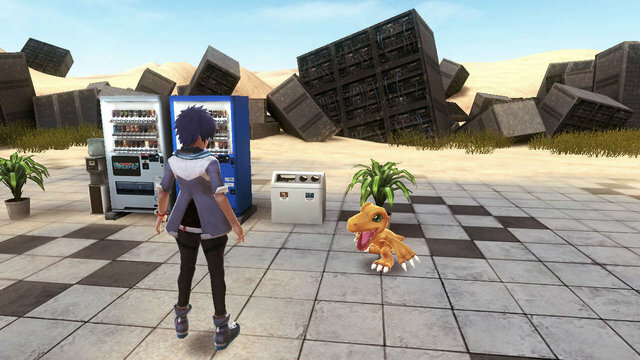 The rules and regulations for Cyber Sleuth are to be announced on-site. September 25th, 2015. Japanese games journalism site Inside Games has published the latest batch of screenshots to come out of Bandai's press kits, alongside several descriptions of the cast and storyline of the 2016 simulation game. 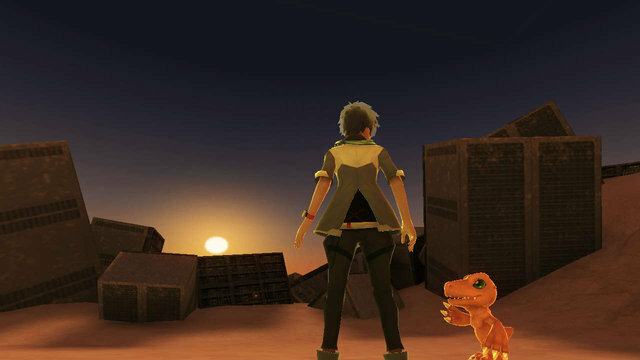 The new screenshots focus on exploring several previously-shown areas during -next 0rder-'s shifting day/night cycle, and on the Digimon's varying emotions in the field. According to Inside, the "opportunity" that allowed the protagonist to slip into the digital world is related to the liquid crystal Digital Monster toys the protagonists wear on their wrists. 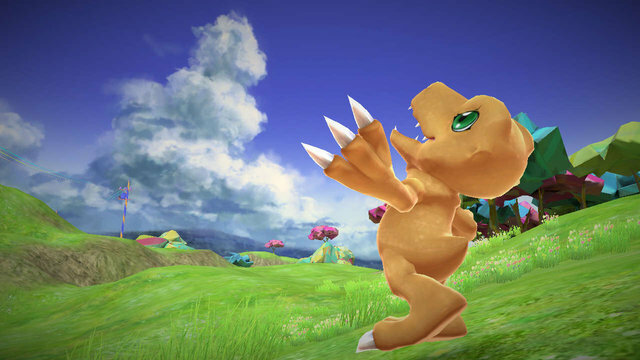 The player characters have received partial focus in past updates, where their past as the runner-up in the Digimon national championships was elaborated on, but until now the actual mechanism of how they ended up on the digital world hasn't been given. When Inside's statement is taken with the official site's most recent update, it becomes clear that the player is transported by their reactivated toy. Bandai has been vague on just which toy they're talking about. August's issue of V Jump magazine pictured an original Digital Monster virtual pet with Omegamon--an impossible combination in historical terms, although not on the Digimon Mini. The official site references one of the Digivice toys, and the time frame for Takuto/Shiki's elementary school tournament would have been during the brief life of the Digimon Twin. Although not officially stated, in light of the recently revealed meaning behind the game's title, it's clear that Takuto and Shiki's names are wordplay derived from -next 0rder-; Takuto from taktstock, a German loanword used in Japanese to refer to a conductor's baton, and Shiki from verb shikisuru "to command." -next 0rder- itself refers to the 0rder Battle system, in which the player issues commands to their Digimon from afar while managing the time delay between a command being issued and being carried out. 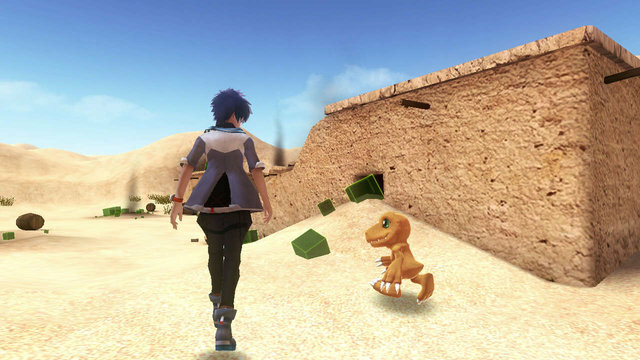 Digimon World -next 0rder- will launch on the PlayStation Vita in 2016. No western release date has been given as of yet. September 24th, 2015. Bandai Namco Entertainment has uploaded the second Digimon World -next 0rder- promotional video to their official YouTube channel. 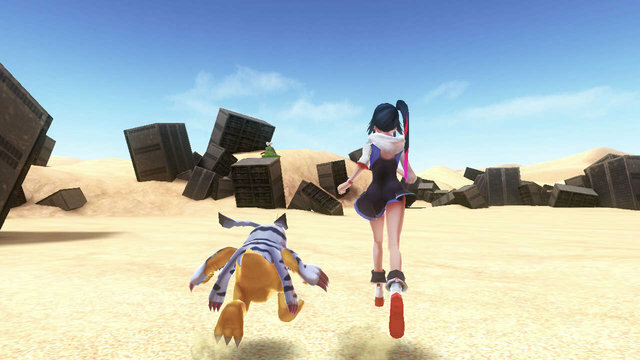 The trailer is identical to that previously shown at the 2015 Tokyo Game Show, which V Jump had made available through their own channel. 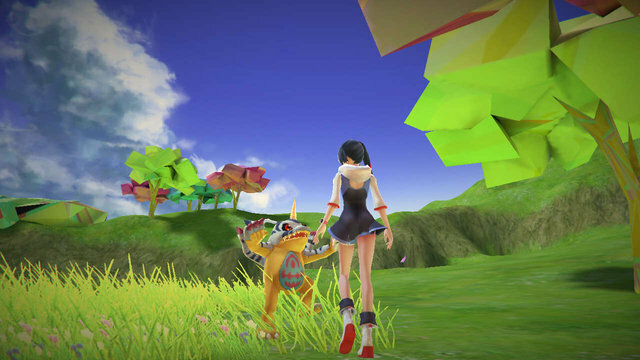 In it, the game's battle system, field exploration, and evolution are shown off, with a glimpsing view of the new Digimon World's controls. Text from the trailer also reveals the meaning of the game's title; it refers to the ❝Ørder❞ Battle system, which will "synchronize the players' and [their] partners' feelings." (プレイヤーとパートナーのキモチガシンクロする❝Øｒｄｅｒ❞バトル pureiyaa to paatonaa no kimochi ga shinkurosuru oodaa battoru). 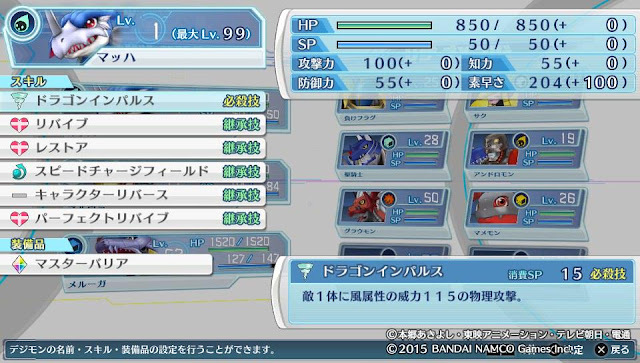 -next 0rder- is literally the player's next orders to their Digimon. Those orders are issued using a combination of the shoulder and face buttons. The controls partially mimic those used in the original Digimon World; the triangle button is used for Items, square for Tactics (作戦 Sakusen), O to Cheer (声援 Seien "Encourage; Support"), and the shoulder buttons for LView and RView (R注視 Chuushi lit. "Observe"). 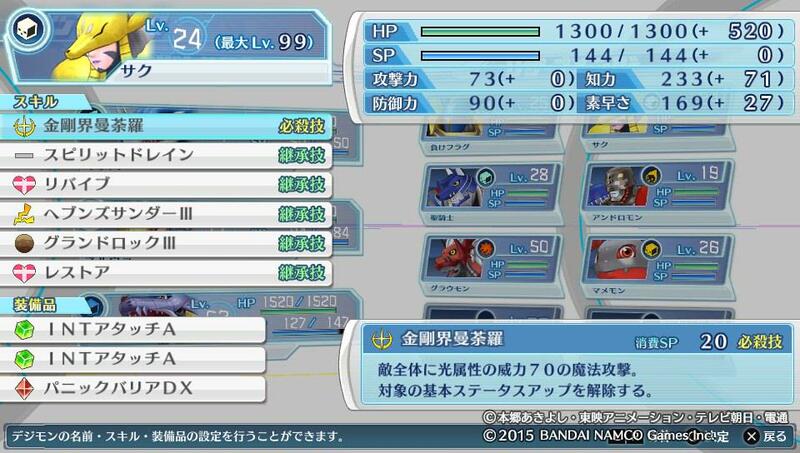 These last options seem to change the view in battle to orient around the perspective of one Digimon. 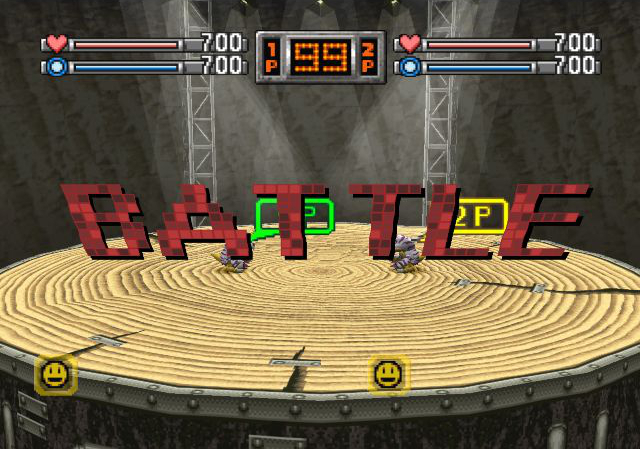 Certain screens have the triangle and square positions swapped but with their functions retained, suggesting that the player will also be able to rearrange the battle HUD to their liking. -next 0rder- will launch in Japan on the PlayStation Vita in 2016. No western release date has been given as of yet. Digimon World has a multiplayer mode. It wasn't used nearly enough in its original lifetime; let's give it a second chance. 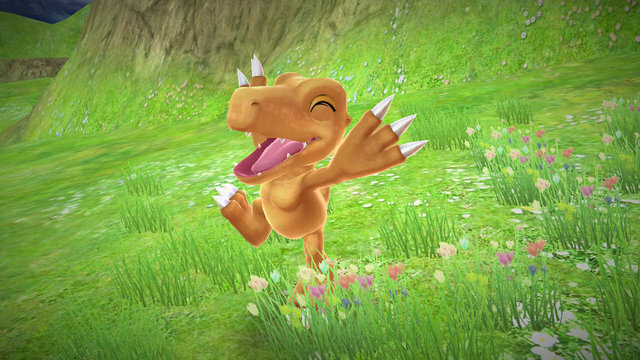 I'm trying to write this for everyone, including players with limited technical knowledge of computer connections, and those that aren't really familiar with Digimon World. We've all been there. Running World's battle mode with another player over the web requires some setup, after all. For starters, you both need to be running the same version of the game (i.e. two American/NTSC-U copies of Digimon World, or two European/PAL copies, or two Japanese/NTSC-J; the different regions are really different games) and both players need to use the same version of ePSXe. The easiest way to do that is just make sure you're up to date with version 1.9.0. Also ensure that you both have up to date copies of each other's memory card save data (the files that are by default epsxe000.mcr, epsxe001.mcr, etc.) and that both players have each other's data plugged into the same slots in ePSXe. (i.e. if player one's memory card is epsxe000.mcr and it's in slot 2 on ePSXe, it also needs to be in slot 2 for player two's ePSXE.) Both players should also be using identical graphics and sound plugins. (Pete's OpenGL GPU comes as a standard in ePSXe; to play it safe, configure your plugins to the Fast default.) 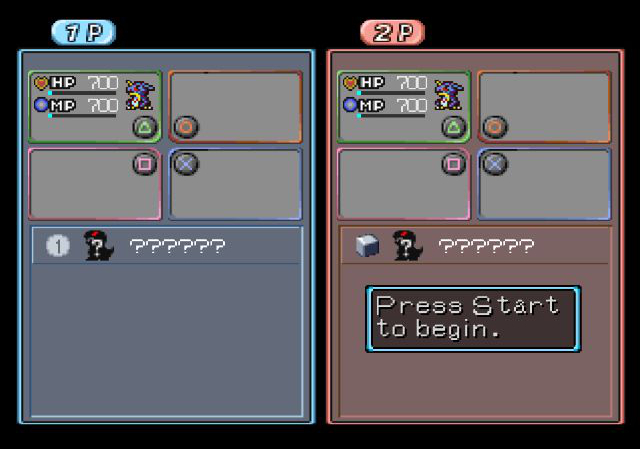 Both players should have a second controller configured, as each one needs to use a different controller in battle mode. (Note that Kaillera always detects the player hosting the game as player 1, and the player that joins them as player 2.) You essentially want your copies of ePSXe and the game to be as close to identical as possible. 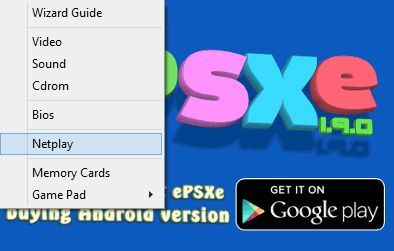 Before starting up your copies of the game, both players need to install ePSXe's cyberpad plugin, which includes the actual client program for linking your systems. (The client is called Cyberpad Kaillera, cpka for short. Hence cpka-v14 is "Cyberpad Kaillera version 1.4." When in use, Cyberpad transmits each player's controller inputs to each other's copies of ePSXe.) When unzipping cpka-v14.zip, extract "kailleraclient" into the ePSXe folder, and move cpka-v12 into ePSXe's "plugin" folder. After that's done, open ePSXe, go to Config > Netplay, select Cyberpad v1.4 and then confirm OK. When you start up Digimon World from your disc or (legally) ripped ISO, as long as Cyberpad is enabled as your Netplay plugin, Kaillera will activate automatically at startup. 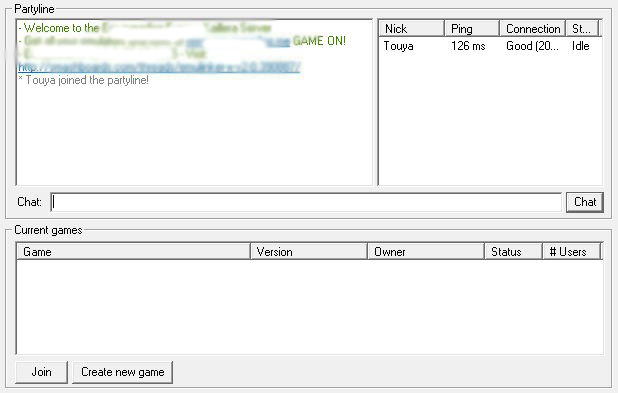 Both players need to connect to the same server. The ms under the Ping section stands for milliseconds, as in the number of milliseconds it takes for Kaillera to send a ping and get it echoed back from the server. How many ms it takes depends on both the strength and speed of connection, and the distance between machines. (i.e. it will take longer to ping a server in Japan from America than it will to ping a server in Hawaii from the same place.) Ideally you want as low ms as possible, although you should also pay attention to the number of games being played because a large amount of traffic on one server can cause delays for everyone. Preliminary testing suggests that for Digimon World, you should have a connection type of at least Good. The quality of your connection in the client is measured in terms of keyframes per second, basically the first and last frames in one animation. This isn't 1988; even Digimon World runs at 40 FPS in battle mode! Setting your connection to Excellent will help avoid things like button inputs being sent late and triggering a pause (and thus a disconnect). There are around 130 Kaillera servers in all, and the recommended ones for now are those operated by Emuparadise. These have no required connection type, and are general-purpose emulation servers. Many of the others are exclusive to specific games. Once you're connected, you'll join that server's chatroom. Here you can talk to everyone else in the server, like on an IRC network. To play with the other player you need to "Create a new game," and they need to join it. 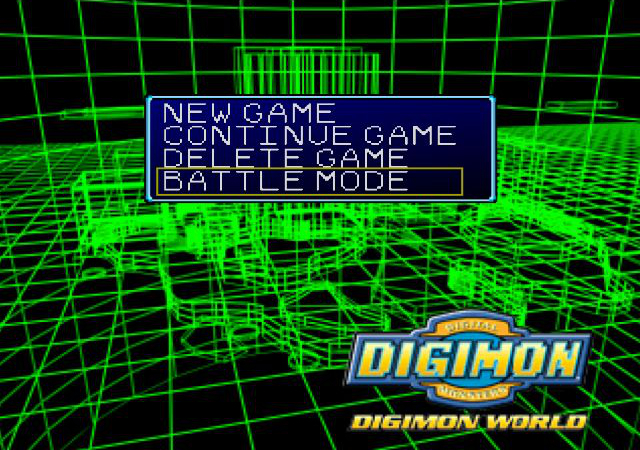 Once you're both in, choose to "start game" and ePSXe will load Digimon World normally. From the start menu, choose battle mode, and from there both players need to load their competition data. 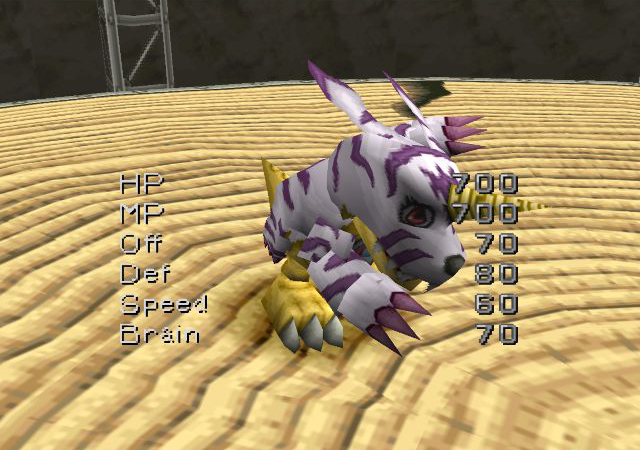 Competition data is a separate type of save data in Digimon World that's created by saving inside Jijimon's house, at the station that looks like a Digital Monster virtual pet. No matter how big and beefy your main game monster is, you can't use it in battle mode unless it's saved as competition data! 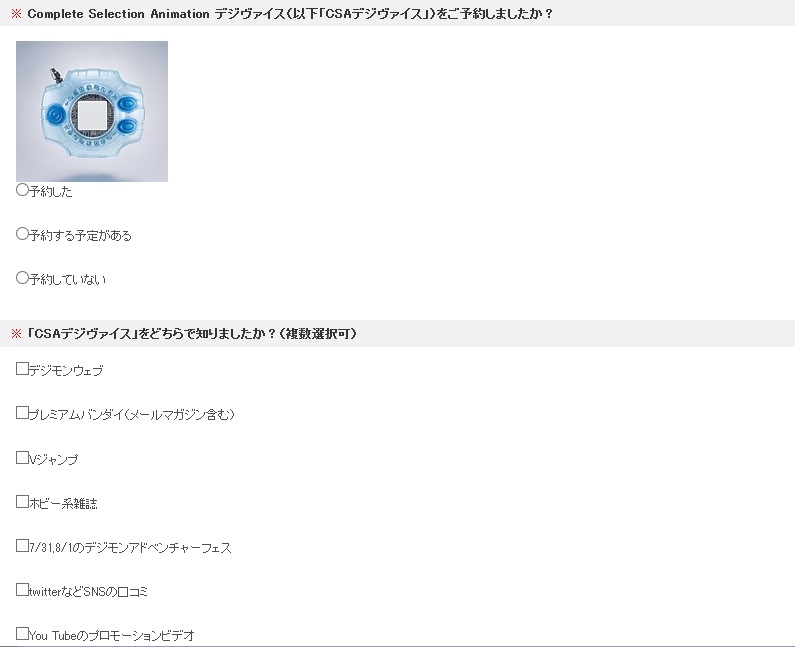 Up to four Digimon can be registered per competition data save file, with each one corresponding to one of the PlayStation's buttons. 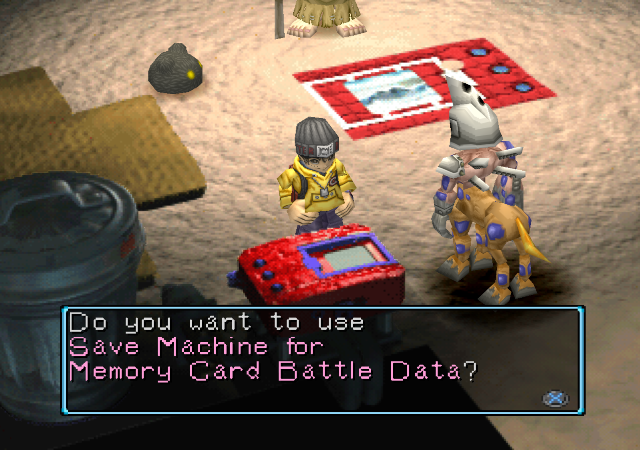 This ensures that neither player knows which Digimon the other one is bringing out until the match begins. 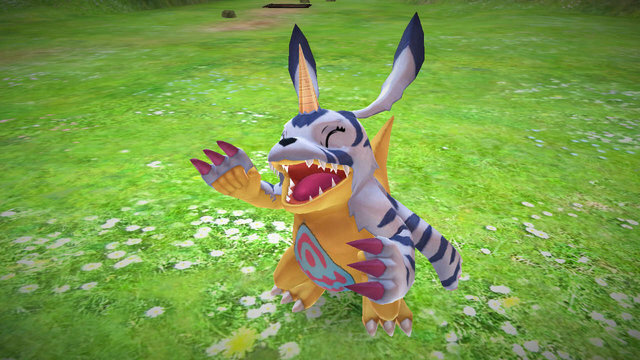 It's important because Digimon World has a triangular weakness system where Vaccine trumps Virus trumps Data trumps Vaccine, so in order to predict your opponent's next Digimon you'll have to rely on psychology. 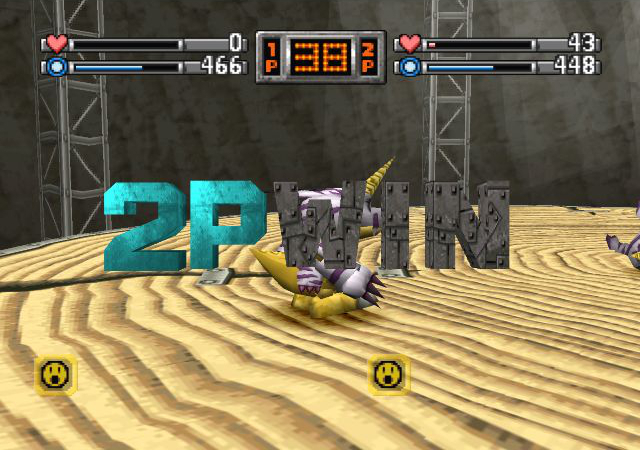 As long as you OK it with your opponent, some other cool things the two of you can do is capitalize on Pete's OpenGL plugin to improve the graphical output on Digimon World, adding texture filtering, screen filters, and even custom filters. Now grab some friends and go play!